It’s been very busy here lately! I’ve been doing a lot of school visiting, and so far have talked about Alec Flint in Boston, The Bronx, Brooklyn, Queens, Manhattan, Staten Island and a bunch of different towns on Long Island. But I figured I’d pop on here to share a link with you. A few things have happened since my last December post, and I wanted to highlight them before the New Year. 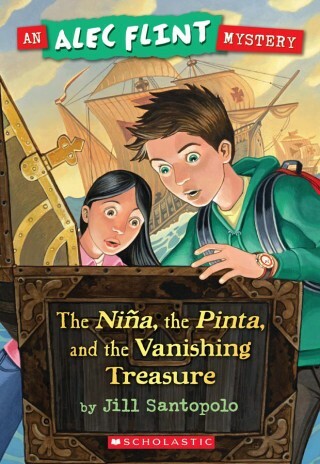 First, The Nina, The Pinta and The Vanishing Treasure was reviewed on KidsRead.com where the reviewer said especially nice things about me and Alec and Gina. They also interviewed me a while back If you want to read it, you can click here. Happy holidays everyone! At the very end of last month, The Nina, The Pinta and The Vanishing Treasure was reviewed on BooksForKids.blog by the wonderful librarian blogger there. Nathan Hale has also re-illustrated the jacket of The Nina, the Pinta and the Vanishing Treasure for the paperback edition, which is coming out in May. Check it out! The jacket for The Ransom Note Blues: An Alec Flint Mystery is finished! It was created by Nathan Hale, and this is what it looks like! Micol Ostow, Vermont College student, mediabistro teacher, and author of the wonderful POPULAR VOTE (among other books), invited me to be part of her cyber release party! You can check out how Alec answers the question “What is the most unexpected cause you ever found yourself lobbying behind?” and can potentially win an autographed copy of The Nina, The Pinta and the Vanishing Treasure as well as an Alec Flint tote bag. Just head on over to Micol’s blog. on Monday, Sept. 18. Vermont College professor, author of many books including the fabulous Tantalize, and blogger extraordinaire Cynthia Leitich Smith interviewed me on Cynsations this week. If you want to check out the interview, just click here. The Nina, The Pinta and the Vanishing Treasure Now in Bookstores! The Nina, The Pinta and the Vanishing Treasure is now in bookstores! Alec Flint: Super Sleuth Available for Pre-order! This just in! My book is now available for pre-order on Amazon! If you want to check it out, click here. And in case you don’t want to travel over to Amazon to see the book jacket, I’ve pasted it below. This art was done by C. B. Canga, too, and I love it. My first book, Alec Flint, Super Sleuth: The Nina, the Pinta and the Vanishing Treasure, will be in stores in July of 2008. Bruce Hale, author of the fabulous Chet Gecko mysteries, read an early manuscript, and this is what he has to say about the book: “A sweet and appealing tale with oodles of kid-appeal. It made me chuckle while whetting my appetite for mystery. 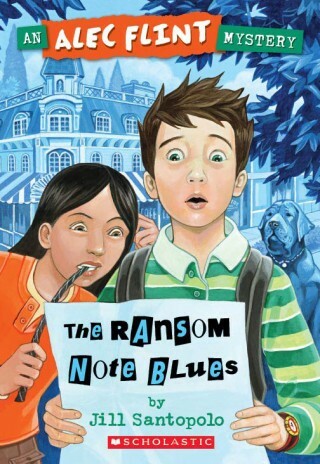 Welcome Alec Flint to the ranks of grade-school sleuths!” Thank you so much, Bruce Hale!